We introduce canvas for pattern-oriented software diagnostics process to facilitate better diagnostic analysis reports. A piece of paper is divided into 3 columns: Input, Analysis, and Output. 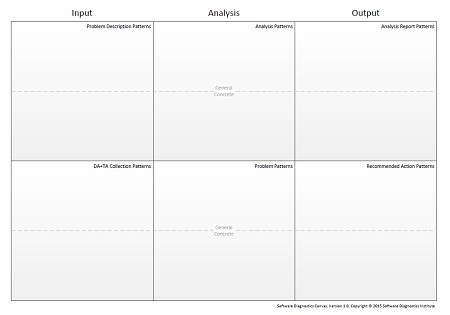 The Input column is divided into two sections: Problem Description Patterns and DA+TA Collection Patterns. Problem Description pattern catalog was introduced earlier in Volume 7 of Memory Dump Analysis Anthology to help with accurate software problem identification. DA+TA Collection pattern catalogs for dump artifacts (DA) and trace artifacts (TA) were also introduced in Volume 7 as Memory Acquisition and Trace Acquisition pattern catalogs. The Analysis column is divided into two sections: Analysis Patterns and Problem Patterns. The former are about diagnostic analysis techniques, and the latter are about diagnosed software problems. The distinction between them was introduced in Volume 8b. All such patterns can be found in Memory Analysis pattern catalog and Trace and Log Analysis pattern catalog . The Output column is also divided into two sections: Analysis Report Patterns and Recommended Action Patterns. The corresponding pattern catalogs are under development. The former is about patterns for useful and meaningful diagnostic analysis reports, and the latter is about the good workaround, troubleshooting, and debugging recommendations. Each cell is subdivided into General and Concrete patterns where the latter are specific product patterns such as a memory access violation in a specific module. The first version of the canvas template can be downloaded from here.